Jung Today is a project on the recent developments in analytical psychology, which gathers together contributions by internationally known professionals. It includes theoretical and clinical unpublished papers that are prevalently written by Italian analytical psychologists, together with some contributions by French, German, British and American Jungian analysts. The book is intended to address psychoanalysts, psychiatrists, child psychotherapists and social workers. 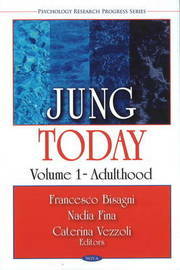 Jung Today is conceived in two volumes: volume one is on adulthood and volume two is on childhood and adolescence. The aim of volume one is to highlight the fertility of C.G. Jung's analytical psychology and how basic Jungian concepts have been recognised by and integrated into modern psychology. The first volume includes both theoretical and clinical contributions applied to adulthood; each chapter focuses on the fundamental themes of the analytical process, from its historical foundations up to the most recent developments. What emerges from the various contributions is the value of the Jungian and Post-Jungian approach in the treatment of so-called "new psychopathologies", such as addictive behaviour and narcissistic disorders of various kinds, as well as other severe clinical conditions in the area of psychotic diseases.